Real Madrid improved to 7-1 in Top 16 Group E by downing Crvena Zvezda Telekom Belgrade 85-61 in the Spanish capital on Thursday. Madrid remained atop Group E while Zvezda dropped to 1-7. 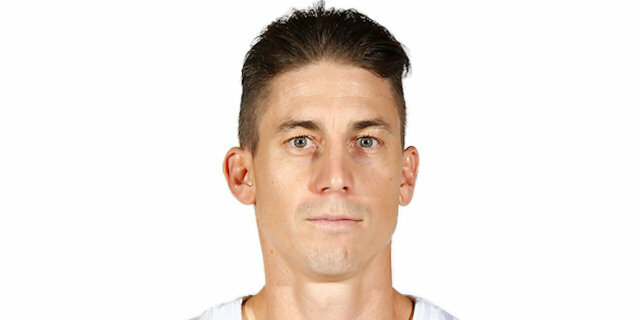 Jaycee Carroll paced the winners with 17 points. Rudy Fernandez added 15, while Sergio Rodriguez had 13 for Madrid. 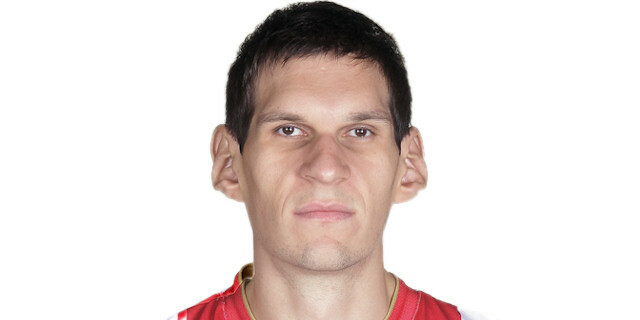 Boban Marjanovic led Zvezda with 21 points and 13 rebounds. Maik Zirbes added 13 points and 9 rebounds for the guests. Marjanovic shined early with a couple of dunks that gave Zvezda a 4-10 lead. The guests still led 16-18 after 10 minutes, but Rodriguez and an outstanding Carroll allowed Madrid to get a double-digit margin, 40-29, at halftime. No three-point shots were made before the break, but a bomb from downtown by Sergio Llull gave Madrid a 60-46 advantage after three quarters. 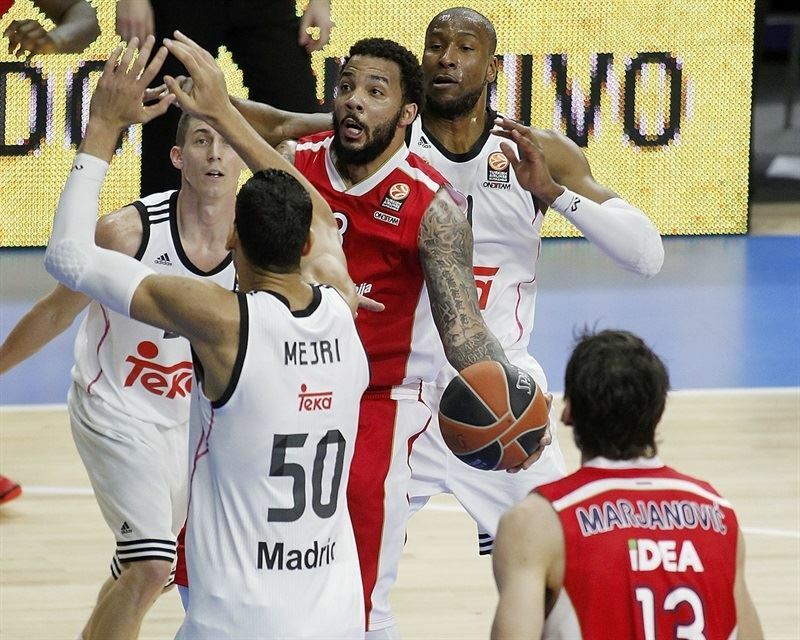 Madrid boosted its margin to 77-56 midway through the fourth quarter and never looked back. Marcus Williams got Zvezda going with a one-handed floater in the lane, which K.C. Rivers matched with a five-meter jumper. Gustavo Ayon scored in the paint but Marjanovic split free throws and added a one-handed slam for a 4-5 Zvezda edge. Marjanovic kept pacing the guests with a layup, as Madrid struggled to circulate the ball. Nemanja Dangubic split foul shots and another dunk by Marjanovic caused all the Madrid fans start to wonder at 4-10. Felipe Reyes rescued the hosts with a close basket, but Jaka Blazic it erased with his trademark driving layup and Maik Zirbes boosted his team's lead to 6-14. Rudy Fernandez stepped up with a one-handed floater and free throws. 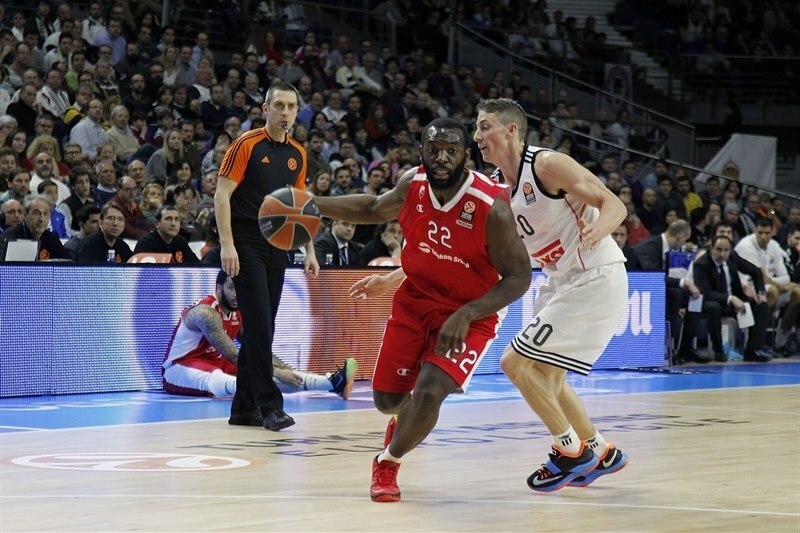 Sergio Llull shined with a three-point play, but Charles Jenkins hit a long two-pointer for a 12-16 advantage. Nikola Kalinic made foul shots, but Carroll scored off a steal and Llull kept Madrid within 16-18 after 10 minutes. 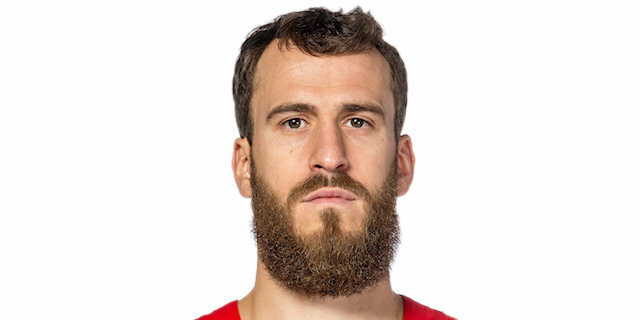 Sergio Rodriguez came off the bench and immediately delivered with a driving basket. Carroll soon added a jumper off the dribble before Zvezda called timeout at 20-18. Marjanovic sank free throws and matched Fernandez's quick basket with a put-back layup to tie the game at 22-22. Carroll scored again and free throws by Fernandez gave Madrid fresh air at 26-22. A fast break dunk by Carroll caused Zvezda to stop the game again at 28-22. Rodriguez and Blazic exchanged baskets and a layup by Ioannis Bourousis gave Madrid a 32-24 margin. Rodriguez hit a mid-range jumper that made it a double-digit game. Marjanovic tried to change things with a dunk and Zirbes added free throws to give Zvezda hope at 34-28. Reyes hit a jump hook and a big basket by Carroll restored a 38-28 Madrid margin. A foul shot by Zirbes and another basket by Carroll fixed the halftime score at 40-29. Marjanovic made free throws right after the break, which Ayon erased with a turnaround jumper. Williams sank foul shots - his first points since the game's opening basket. Ayon kept Madrid way ahead at 44-33. Marjanovic dunked again and a layup by Williams brought Zvezda a bit closer. Fernandez nailed an off-balance jumper, before Williams provided a highlight with a big basket. A layup by Marjanovic caused Madrid to call timeout at 46-41. Fernandez hit a step-back jumper and soon added a three-pointer - the first in the game! – to establish a 10-point margin. Reyes hit a jump hook, which Marjanovic matched with another put-back slam. Llull and Dangubic exchanged free throws before a layup by Jonas Maciulis gave Los Blancos a 57-45 lead. Llull struck from downtown to give Madrid a 60-46 cushion at the end of the quarter. Carroll took over with a one-handed floater in the lane early in the quarter. Zirbes stepped up with a big basket in the low post and a two-handed slam to keep Zvezda within 62-50 with eight minutes left. Carroll quickly answered from downtown, but Williams fed Zirbes for a close basket. Rodriguez restored a 15-point lead. Kalinic and Rodriguez traded baskets and a layup by Marcus Slaughter forced Zvezda to call timeout at 71-54. The guests kept running their offense through Zirbes, who scored around the basket. Slaughter split free throws and a close basket by Rivers sealed the outcome, 74-56, with four minutes left. Rodriguez buried a three-pointer and even though Zvezda kept trying, everything was said and done already, as the Madrid fans had plenty of time to celebrate yet another Top 16 home win. "It was important to win this game. Both teams came off intense weekends, as we won the Spanish King's Cup title and they lifted the Serbian Radivoj Korac Cup trophy. It was hard for us to get back into competition. It was a game in which were not physically fresh but made up for that with good mental strength. 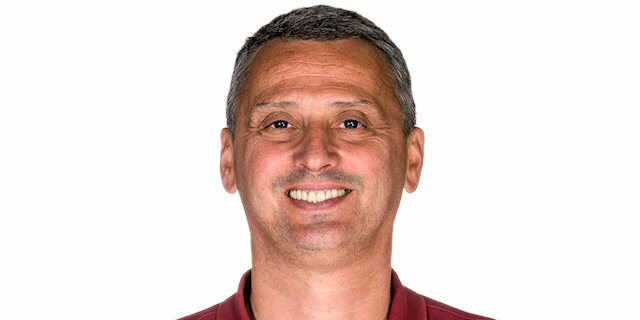 I am happy because I rotated my players to give our team fresh air when we needed it most. Despite being tired, we played at a very good rhythm. We hope to make it to the playoffs as soon as possible." "We played well in the first half and even managed to get a small lead. From that moment, we paid a high price for our mistakes and Madrid managed to get a good lead. And once Madrid takes off, it is hard to get back in the game. Madrid has improved since our last showdown against them in Belgrade. They were playing well in January but are doing even better now. They made some adjustments and right now, there are an even bigger candidate to make it to the Final Four and have chances to be the Euroleague champion." "It was hard for us to get into the game. Zvezda played tough but we finished really well, getting a good win. I feel good, happy, looking for opportunities to help the team. I am making an effort to add defense to my game and help the team and sometimes it works for me. We came back after the King's Cup and got back to the Euroleague, where you have to compete. It is kind of tough after three games in a row over the weekend but we came out and played well enough to get an important victory." "The most important thing is that we played well and were focused. It was hard for us in the beginning, which is logical, but we beat a good team and I am happy for that. We all know how important home wins are in the Top 16. We cannot lose at home and it was a difficult game after a very demanding weekend, with a lot of adrenaline, but we managed to get a good result. We are tired after three tough games in the King's Cup. We were not as fresh as in a regular Euroleague game,as we didn't get that much rest over the weekend, but we solved it pretty well." "We had a good start, but had many turnovers from the very beginning of the game. We had a lot of turnovers throughout the whole game, which allowed Madrid to play fast. We lost our early lead and Madrid was ahead from that moment until the end. Not playing good defense and picking up so many turnovers were the keys to our loss."